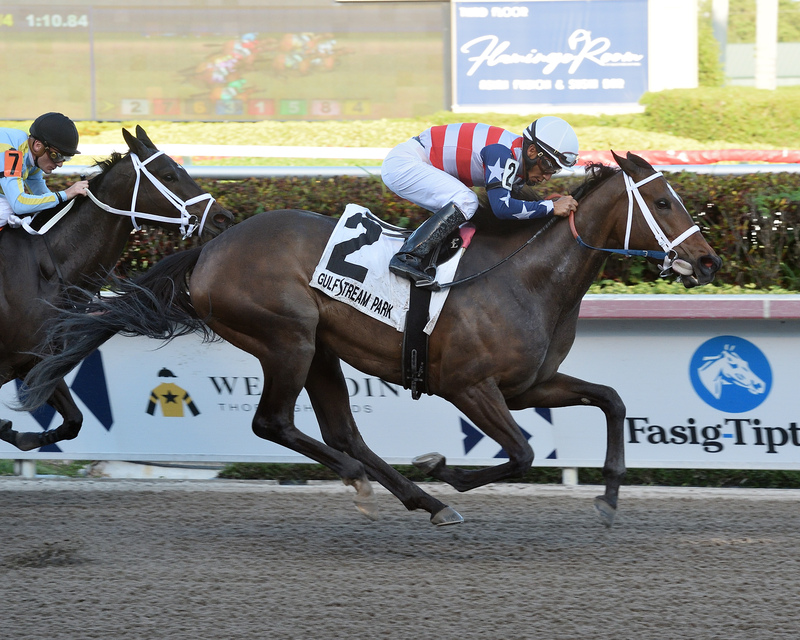 The four-year-old filly America's Tale, displayed a new dimension to her running style with a victory in yesterday's G2 Inside Information Stakes at Gulfstream. Normally she likes to boss opponents but was ridden here with more restraint racing close up in 4th and 3rd early. Jockey Paco Lopez brought the Bernie Flint trained filly outside to take on Razorback Lady who was trying to lead from wire to wire. Paco set America's Tale down into the drive position and she edged clear in the last sixteenth by 1 1/4 lengths. She was good value for this margin after seven furlongs as she won her first graded stake for owner Naveed Chowhan. Post race the delighted owner said "She's been really good for us, she's been training great. For the past couple of months, we couldn't find a race near New Orleans for her, so this is her distance and we're glad we shipped her down here." The Gio Ponti filly's pilot also was quoted after the race and told reporters "I took her outside and sat outside horses, and in the stretch when I asked her, I had plenty of horse. She's a very special filly." America's Tale was bred in Kentucky by Madeline Auerbach and Catherine Parke and boasts a 6-3-1 record from 17 starts to date.